The Russian Wild Boar is native to both Europe and Asia, but for purposes of sport hunting, they have been introduced in North, Central, and South America. Hunting Wild Boar is very challenging because despite its poor eyesight, it possesses keen senses of smelling and hearing and is a very muscular animal that relies on its quickness and wits to elude hunters. Boars use their sharp tusks to search out food by uprooting everything from tubers and roots to small animals and snakes. These mighty tusks can literally bulldoze through an area of ground and are fierce weapons that sometimes reach five inches in length. The Russian Boar is built like a SHERMAN TANK so you will want to bring the biggest caliber rifle or pistol you have. Bow hunters will need plenty of arrows. These Wild Boars have a very thick hide and are extremely robust. They can be killed clean if hit in the proper areas, but it can be very elusive. 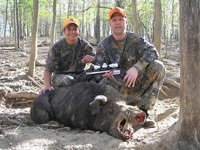 Russian Boar up to 300 lbs are hunted from December thru the end of August.